Red Rooster Plastic Slats are a world class broiler breeder floor (and Dog Kennel Floor) that is manufactured in the United States but distributed worldwide. With over 30 years of proven global performance, Double L Overlapping Plastic Slats are a very durable, cost effective, bacteria resistant, long lasting floor that was designed to replace wood and wire slats in poultry houses. Red Rooster Slat Flooring creates the proper environment for your birds to develop to their genetic potential for outstanding production. Wood slats are prone to drying, cracking, and breaking - resulting in breast blisters and foot injuries. Since wood slats are narrow and irregularly spaced, the bird's feet often fall between the slat, causing foot pad and hock injuries. Wood slats also harbor bacteria, causing infectious diseases and mortality. Unlike wood slats, Red Rooster Overlapping MKII Slat Floors do not deteriorate or need to be replaced after each flock of birds. Double L plastic slats have never had reports of bumble feet, breast blisters, wood slivers, or foot pad / hock injuries. Used with success under birds of all sizes from little chick to large chickens, Red Rooster Broiler Breeder Plastic Slats are a stable structure for walking with minimal sag. Red Rooster Overlapping Flooring is constructed of no break polypropylene, which is more durable and has more impact resistance than regular polypropylene. Each slat is easy to power wash clean with approximately 55% manure filtration. Neutral polypropylene does not absorb body heat from birds and improves production rates. Easily installed on 2 x 4" or 2 x 6" wooden supports, Red Rooster flooring can be cut to specific sizes. Reinforced pre-molded screw holes allow for fast assembly of slats to frame. The OL Red Rooster® Flooring's plastic construction is corrosion-resistant and has the ability to have both 4' sides of panel interlock for added strength. Each of the 2' ends of panel overlap (OL). Double L's MKII Overlapping (OL) Red Rooster® Flooring only needs supports every 24". The overlapping style slat is usually used for large continuous floors that will not be moved. Red Rooster Overlapping Slat Flooring has a smooth, non-porous surface that is easy to clean and disinfect. It has been proven that eggs laid on square openings, regardless of surface area, were significantly cleaner than eggs laid on wooden slats. Each Red Rooster OL slat is non-corrosive and will not harbor bacteria, rot, rust, or absorb water like wooden slats. Red Rooster Flooring has a smooth, non-porous surface that provides a stable, comfortable platform for birds. Unlike wood floors, the birds are protected from breast blisters, leg problems, slivers, foot pad and hock injuries. 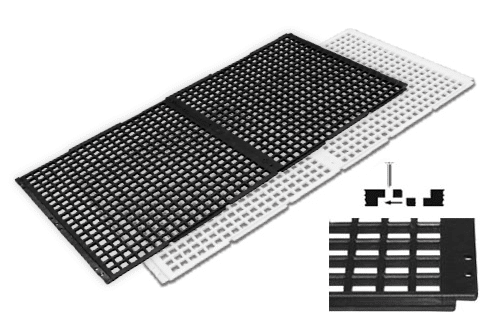 OL slat flooring is available in white or black color, with the black slat flooring UV protected. The solid structure of Red Rooster® means stability. It has been used with success under birds of all sizes - from little chick to large chicken! It is a stable structure for walking with minimal sag.